Toshiba, the well-known company of manufacturing quality electronic gadgets is spreading its market in the tablet segment with several new releasing. It has come with two new Windows 8.1 tablets of Encore series. Its Encore 2 series tablets come in two different sizes, one with 8 inch display and the other with 10 inch display. The Encore 2 range tablets perform with Windows 8.1 and come along with Bing version. Both 8 inch and 10 inch Windows tablets fall in the price range of $269 (around Rs. 15,900) and $199 (around Rs. 11,800) respectively. It is also expecting that it would be started to sale in US from July. Both devices offer same resolution of 1280×800 pixels with multi-touch display. On the shooting front, they have front-facing HD webcam of 1.2-megapixel clarity along with 5-megapixel rear shooter to meet with the need of recording high resolution videos and capturing high quality images. Devices are coupled with Intel’s quad-core Atom Z3735F processor, clocked at 1.3GHz. These are coupled with 32GB of internal storage and can be configured with upto 64GB internal memory. They support microSDXC card with upto 128GB of data storage capacity. The main difference is to notice among both devices is RAM with different sizes. Encore 2 10-inch is crafted with 2GB RAM while the 8-inch tablet has 1GB RAM. Both gadgets come incorporated with Wi-Fi 802.11 n and Micro-USB 2.0 connectivity features. 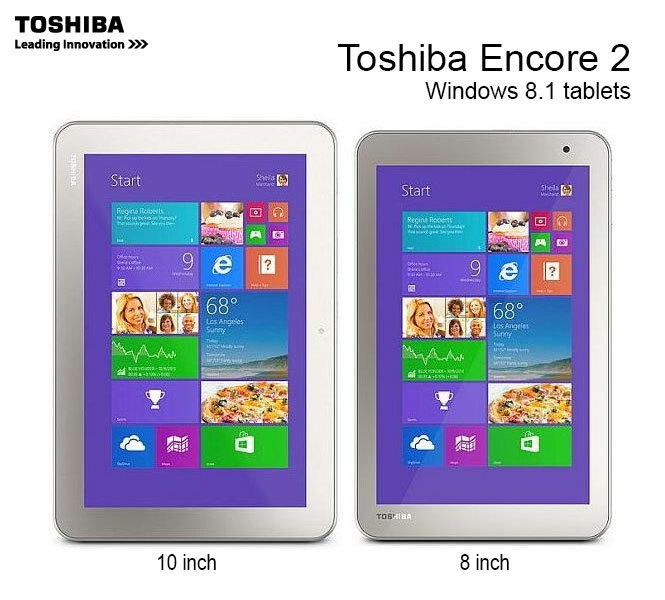 Encore 2 8-inch tablet is weighed 367 grams and Encore 2 10-inch is weighed 548 grams. One year subscription of Office 365 Personal will have been provided by the company for both devices. Windows tablets of Toshiba, having capability of performing well for 8.5 hours on single charge. Not any other details about both devices’ specifications and features are cleared yet but soon will be caught whenever the devices go on sale for US market.